This 1/2" thick, tempered-glass vessel is circular with a silver mesh pattern embedded in the smoky black interior; while the exterior displays a matte silver appearance. Its non-porous surface is extremely attractive and sanitary - naturally resistant to stains, odors, discoloration, and heat damage. With an overall measurement of 16 1/2" x 16 1/2" x 5 3/4", it will require a minimum-width cabinet of 18". The 718-BN vessel-style faucet features fully-tested, superior-quality, solid-brass components. This single-handle model is the tallest offering in its class, standing at a 13 3/8" height with a 4 3/4" spout reach. 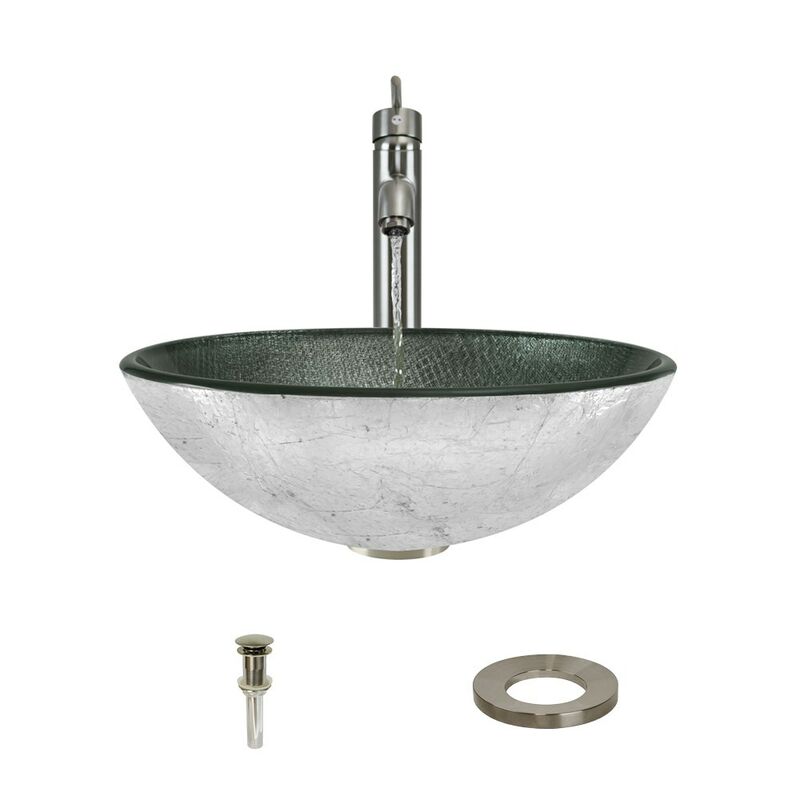 It features a brushed nickel finish over its cylindrical design and comes with a matching baseplate. The rod-style handle atop the column swivels up-and-down, or left-and-right, to control both water pressure and temperature; while ceramic disc cartridges assure long-term dependable operation. The faucet is constructed without lead and is compliant with NSF (National Sanitation Foundation) standards, the Safe Drinking Water Act, the cUPC (Uniform Plumbing Code of the United States and Canada), the ADA (American Disabilities Act) and carries the EPAs WaterSense label. The included sink ring stabilizes the curved bowl above the counter and coordinates with the brushed nickel finish of the other fixture's. Additionally, a spring-loaded, vessel pop-up drain (vpud) is included, which opens and closes with a simple press to its attractive brushed nickel cap.